The next river crossing is a stepping stone footbridge. I originally thought it was for people walking across the river until I got closer to the bridge. I had to walk across the bridge in order to see what the sign said. I had to take pretty big steps but I managed to get across. 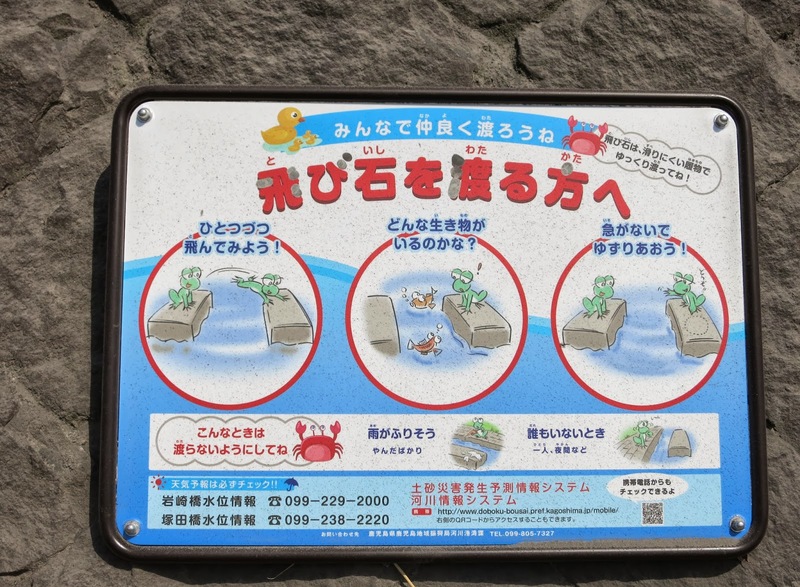 Although I couldn't read the Kanji, the pictures suggested that this bridge was not for people but for frogs. Perhaps the frogs worry about being eaten by fish or they have trouble swimming across when its raining because of the strong current. This bridge gives frogs a way to cross the river safely (unless the herons see them). Kagoshima Prefecture, Japan's Bridges: Animal Bridge across the Kotsuki River by Mark Yashinsky is licensed under a Creative Commons Attribution-NonCommercial-NoDerivs 3.0 Unported License.